The summer bounty is good and plenty. Can you believe we’re doing this? We’re going there. It’s time for zucc salad and this is my sorry-it’s-not-fried face. Also, this is my why-must-vacation-end face. Why why whyyyyyyyyy. Also related but somewhat (oh shocking) unrelated: is it really a vacation when you’re a mom? Says this mom of one bug. Let’s be real. Tell me. The only good part of vacation ending was the absolute ridiculous amount of tomatoes that I came home to. Like tons! Right there in a container next to lots of jalapeno peppers too. I see copious amounts of guac and caprese in my future. Come over. Brings mojitos! Yesssss this is the zucchini recipe I’ve been telling you guys about – it’s been one of the ways that we were consuming zucc and leftover corn for a few weeks before vaca. If we can do it, you can definitely do it. Truth be told, I was only marinating it, tossing it with the feta, chopped mint and corn – and that’s it. It was more of a side than a salad (oh hi grilled burgers). But then when I decided to make it for the blog, I really felt that it just… needed something. That something was – garlic butter toasted pistachio breadcrumbs. I’ll say it again. Garlic butter tasted pistachio breadcrumbs. Eeeep! !!!!!!!! In general we try to eat a bit healthier during the week and indulge more on the weekends, but my thing is that I can’t have, like, a completely plain and boring salad on Monday because then I’m all omg cheese! almonds! peanut butter stuffed pretzels! peanut butter spoon in chocolate chips! give me everything that exists in the house other than my planned salad! It’s all I can think about and the salad ends up being an app to many other delicious things. With a GOOD salad I need a little extra. Extra extra. Cheese, toast, bacon – whatever it is. Just a teeeeeeny bit. Then I feel super great about eating my greens and not like I just went from zero to 100 over the weekend and back. This totally helps with that. So these breadcrumbs. Oomph. I’ve made many versions before. I love the toastiness and garlic butteryness. It adds that texture that I really love and honestly, really need with my vegetables. And pistachios! They needed to be here today. Desperately. It was the right choice. The mint adds a fresh little kick that freaked Eddie out at first but it just works. I suggest chopping them if you’re scared. It will all be okay. We can do this, right? Monday? August? The final leg of summer? The return of real life without ice cream everyday and sunsets every night? We can! I believe in us. In a bowl, whisk together the vinegar, lemon juice, honey, garlic, basil, oregano, salt and pepper. Continue to whisk while streaming in the olive oil. This dressing stays great in the fridge in a sealed container for a week or so, so feel free to make a double batch if desired! To peel the zucchini, I slice off the top and set the bottom on a cutting board. I peel downwards with a vegetable peeler – it’s up to you whether you’d like to leave the skin on or not. Place the zucchini in a bowl. Pour half of the dressing over top of and toss to coat. Cover the bowl with plastic wrap and stick in the fridge for 1 to 2 hours, or even overnight. About 30 minutes before serving, I like to crumble half of the feta in and toss so it marinates too! 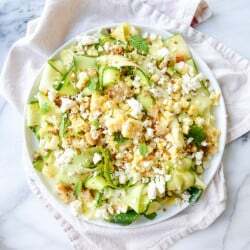 To serve, toss the zucchini with the remaining feta. Place in a large bowl or on a plate and cover with the fresh corn off the cob. Drizzle with a bit of extra dressing and offer it to serve. Add the butter to a saucepan over medium heat and whisk constantly while it bubbles. The minute brown bits begin to form on the bottom of the pan, remove from heat and whisk for an additional 30 seconds. Let the butter stand for 1 minute, then add in the garlic, bread pieces and pistachios and stir well to coat and combine. The butter should still be hot enough to slightly toast the bread and nuts. If not, heat it over low heat while stirring constantly. Set aside until ready to use. I know you want the bacon. Do it. July Favorites: Food + Fun. We’re coming home from vacay too this week, it seems like everyone goes away in July! But coming home to garlic butter toasted pistachio breadcrumbs does make it all seem a little easier. Our garden, not doing so well! Not enough sun. Oh well, there’s always bocce ball, Can Jam, badminton, and tether ball in the back yard! Last night, my husband made the universe-shattering comment that he WANTED TO EAT MORE SALAD. But not “normal” salad, lol. I think this fits the bill! Beautiful!! I visited my parents a few weeks ago and came home with an insane amount of produce including four, yes FOUR plastic bags full of zucchini! I think I know what we are doing for dinner! Hi Jess! I hate that it’s been so long since I’ve said hi! I hope all is going well with your adorable new nugget. I’ve been dying over your instagram vacay pics! Love! I’m returning to the U.S. after 5 months in Brazil and the most absurd kitchen you’ve ever seen and cannot wait to start cooking again. This salad is first on my list of things to make! I just want all of the fresh, vinegary things in my life right now. And it’s gorgeous! Love the big zucchini ribbons and those bread crumbs.. Yum! THANK YOU FOR POSTING THIS! My garden has exploded zucchini. Wow this looks SO good!!!! I can’t wait to try this!!!! And those toasted breadcrumbs are spectacular. OH MY GOODNESS!!! You had me at brown butter pistachio bread crumbs. This looks like the perfect balance between refreshing and indulgent. YUM! Stupid question…but the corn? Right off the cob? No boiling, steaming, nothing? Oh that is so lovely! We love the bounty of corn and zucchini around this time of year, but sometimes run out of new ideas. I will definitely be trying this! This looks so amazing! I need to make this soon! The end of vacation is always soooo sad. When I get home, I always try to put a plan into action that would allow me to vacation all of the time…which, unfortunately, never materializes into anything! Aahhh this looks awesome! I am so with you. Trying to eat a bowl of lettuce in a simple dressing usually winds up being followed by (a lot of) ice cream. I need a few more things (non vegetable things) to keep me interested and focused. Going to have to try this one! So happy to see those fabulous bread crumbs at it again!! They look incredible on this salad! YUM! I love salads with fresh corn. I will have to try this since my garden is overflowing with zucchini. This sounds like the best salad for summer veg! I love all the different textures, and those breadcrumbs sound fantastic. Yay! I made this last night, but I didn’t have corn so I decided to mix it through some pasta instead. It was AMAZING. Thanks for another awesome recipe! I want to sink my face into that plate. Our zucchini didn’t do too hot this year but we have tons of tomatoes and peppers too. It is glorious! 1. I love breadcrumbs on zucchini…but I usually roast it…can’t wait to try it with a salad and I have everything to do this, except corn. So, I’m going to grab some and do this! OoOo these breadcrumbs are amazing! :) Pinning! This is gorgeous- my kind of salad for sure. The colours are beautiful- and i think this is what healthy eating should actually look like. I love zucchini noodles but I’ve never tried marinating them before. I think this would add much more flavor! Love your breadcrumb idea! To this I say, I do. Totally in love with this. Love the bread crumb concoction! Um yea, this sounds like an AWESOME salad! I’m obsessed with zucchini and know I’d love it. Bookmarking now so that I can make it soon! I’m making this tonight and I’m soooo excited! I made this last night and it was delicious! Wish I could have taken a picture to share but we were too hungry and just dug right in!